Carrying on with the woman’s subject. Here is a nice social poster of the seventies devoted to elimination of spongers and parasites not only in the economy, but in private life of Soviet people as well. 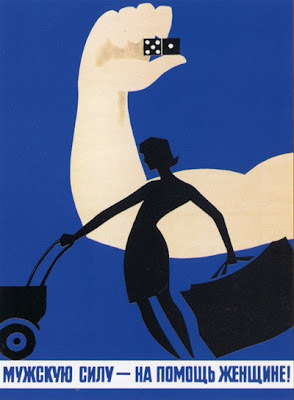 The forefront of the poster is occupied by a shadow image of a tiny woman bent under the housekeeping workload: the perambulator and a big bag with some food and goods in it. Actually, the times of deficit were never far away, and in the seventies Soviet people had to spend lots of time standing in queues after work. So working full time, nursing a baby and getting food for the family all in one day was a hard occupation indeed. On the contrast the background shows a healthy and strong hand of a man, who is holding nothing but a standard domino bone, which is apparently very light. In the Soviet times dominoes were extremely popular – it was a game of ordinary working folk. The chess were too complicated, cards were usually gambling, and therefore played on bets giving it a criminal flavor, backgammon was played mainly by the Easterners – so dominoes ruled the yards near the newly built Khruschev’s blocks-of-flats, later named Khruscheby (“Khruschev” and “truschebi” (slums) merged together), factories at lunch times, and all other places, where Soviet men could cease working without aftermath. Homes were such places as well, so a great majority of women were heavily overworked compared to men. Obvious inequality, it is. And the socialism was declaring that both men and women were equal. Hence this poster. i don't like your translation. man's power is accusative, help is accusative too, and woman is dative. i think it's trying to say "to have manly power is to have help from a woman." feminism was strong in the soviet union. you have to give the soviets credit sometimes. but not often. i do think you're right that it's supposed to discourage men from goofing off and gambling.